There was more than a little irony in the result of the Singapore Grand Prix. Nelson Piquet has seemed out of his depth this year and in Singapore he crashed heavily on lap 13. 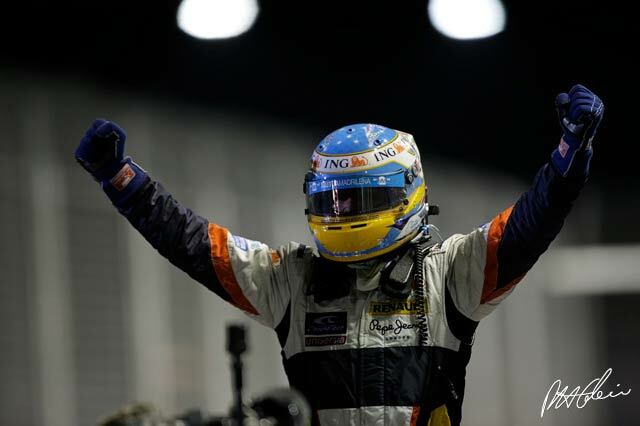 But in doing so he handed victory to his team-mate Fernando Alonso, who had gambled on a very short 12-lap first stint. He was thus perfectly positioned to take advantage of the situation. The other major players were all delayed or penalised and Alonso moved up to the front on lap 34. And there he stayed, while those behind him were trapped behind slower cars. There were some cynics (there always are) who reckoned that the team's strategy was to have Nelson crash soon after Fernando had completed his stop and thus create a situation in which Fernando gained an advantage over the rest of the field. One can see this argument, but one likes to believe that no team would ever be so desperate as to have a driver throw his car at a wall. In all probability Piquet just screwed up - he has done that a lot this year. If not, he must have been offered something worth having because he needs to impress in the few remaining races as this has been a very poor season. It will be interesting to see whether he gets a new contract for 2009. A Renault victory was not the kind of thing that one would expect to see this year for the cars have never really been that quick, but around the streets of Singapore the car seemed better. Some said it was Alonso that made the difference, but that did not really make sense as Piquet was quick in some sessions as well. Alonso himself admitted that the idea of winning "seemed to be impossible" after the screw up in qualifying with Fernando lining up 15th on the grid. "It is a fantastic first victory and I am extremely happy," Alonso said, carefully making sure that everyone understood that he was still available for hire in 2009. "I cannot believe it right now. I need a couple of days to realise we won a race this year! Suddenly we have been competitive all weekend. We were unlucky yesterday and lucky today. The first Safety Car helped me a lot, and I was able to win. We had to have an aggressive, short first stint, because it is so hard to start 15th here. The start was good but not good enough, and we were very lucky, but the pace was there and the car was super today." The pace was definitely there as Fernando set the third fastest lap - after the two Ferraris - and quicker than Hamilton and the rest of them. A win is a win and Fernando was glad to have it. Renault's good day was matched by the awfuless of Ferrari's Singapore GP. Massa had led from pole and looked solidly on his way to victory. He probably had a smaller fuel load that Hamilton as he was able to pull away. Raikkonen in third was hanging on too. The Piquet accident and the Safety Car threw the team into total chaos. The two cars came in together, which meant that Raikkonen was going to lose time no matter what happened. And then it went really horribly wrong. Felipe Massa departed the pits with the refuelling hose still attached to the car. This knocked down four team members but fortunately none was hurt and the fuel that sprayed around did not ignite. To make matters worse Felipe pulled straight into the path of Adrian Sutil - just as he had in Valencia. This would earn him a drive-through penalty later in the race. He had the presence of mind not to leave the pits, however, and parked at the end of pitlane and waited for his crew to sprint down pitlane and after much pulling and shoving they managed to disconnect the hose and Massa went on his way. He and Kimi were both down at the back by then. After that Massa made a series of mistakes, which suggested that he had blown his cool completely, while Raikkonen stuck to his task and managed to climb up to fifth place. That was something, but with three laps to go Kimi made another unforgivable mistake and crashed into the wall. Ferrari lost the lead in the Constructors' Championship. And you can bet that the Italian media will not be very kind on Monday morning. When Raikkonen hit the wall, the Italian journalists could be heard muttering that the time has come for Alonso to head down to Maranello. Raikkonen looks more and more like a busted flush. Alonso was not the only man to gain from the Safety Car. David Coulthard, Mark Webber and Rubens Barrichello all scampered into the pits before race control decided that a Safety Car was needed (and thus before the pits closed) and so they were well served. Sadly Barrichello's race lasted less than a lap after that as the engine let him down. The advantage gained by the Red Bulls was short-lived but significant. Webber ended up retiring with a gearbox failure after 29 laps, while Coulthard found himself just ahead of Lewis Hamilton. The McLaren driver had lost time in the pits and so found himself repeating the problem he had had in qualifying. The Red Bull was just quick enough to get in the way but not slow enough to overtake. Lewis would be stuck behind DC until the second stops and that meant that he would have no chance at all of catching Alonso. He was also held up so badly that he could do nothing about Nico Rosberg. "My first stop went really well," he said later. "I had to wait as a few cars were coming past including Felipe, so I lost a little bit of time but it didn't cause me any troubles. We had great pace, but I was just unfortunate to get stuck behind DC. It was so difficult to get close enough to him to overtake." Towards the end it was very clear that Lewis was not trying too hard, knowing that his championship rival Felipe Massa was out of the points. Third place gave him six points and thus he increased his lead significantly with just three races still to run and managed to avoid getting into any trouble with other cars, stewards or anyone else. "We got six points so it was a great race for us," he said. "There was no need to take any risks as the Ferraris were out of the points, but when you get close to people it's just impossible to overtake. But I did enjoy driving this track. I'm very, very happy." Heikki Kovalainen had a lacklustre afternoon. He had a brush with Robert Kubica in Turn 3 on the first lap. This damaged the floor of his car and he lost two places. He then had to wait behind Hamilton during the pit stops. "Most of the time after that I was in traffic," he said. "There were no overtaking chances. And then I had brake problems and had to conserve them." Nico Rosberg gave Williams a much-needed result with second place. On the first lap Nico dropped from eighth to 10th. He was stuck behind Jarno Trulli and was told by the team that if he did not get ahead the race was effectively over. "I absolutely had to get ahead of him to allow my strategy to work," Nico explained. "It was quite a hairy moment getting past because it is so bumpy to outbrake at Turn 7 and I couldn't get close at Turn 1, the only two places where overtaking is possible. I cleared him and then I could not believe when the Safety Car came out just as the team called me in for my pitstop. I thought that was the end of it." This meant that he got a stop-go penalty but that took so long to come through that he was able to build himself a decent lead before he had to stop and that meant he rejoined in fourth place. As others pitted he moved to second and there he stayed. Kazuki Nakajima drove a rather more conventional race without gaining any unlikely advantages and he ended the Grand Prix in eighth place, adding another point to the kitty. Behind Hamilton at the end of the race was Timo Glock in his Toyota and this was a good result for the German. He made no mistakes and overshadowed Jarno Trulli who reckoned that a one-stop strategy would be a good idea and suffered for it. In the end he got nothing as he was sidelined by an hydraulic failure. Behind Glock was Sebastian Vettel, picking up some more points for Scuderia Toro Rosso. He was fifth early but lost ground during the Safety Car and lost a place to Glock when he missed a braking point. Sebastien Bourdais had a pretty poor afternoon, stuck in traffic most of the time. He finished 12th after a number of incidents and adventures. It was not a good race for BMW Sauber. Kubica was fourth early on but was forced to pit before the pitlane was open and so had to go back and do a 10sec stop-go penalty. By the time that was done he was at the back of the field and so filled the car full of gas and drove for home, ending up 11th. Nick Heidfeld drove a standard race and as the other frontrunners fell over themselves and others he moved up to finish sixth. "I could have gone a lot faster if I hadn't been stuck in traffic all day," he said. "It is such a shame." Coulthard ended his day back in seventh, but was happy to get two points. Jenson Button finished ninth, which was not bad after a poor start dropped him to 14th. "It was one of those races where luck and the timing of the Safety Car could make or break you," he said. "Luck was not on our side and the timing of the two Safety Cars hurt out strategy. We were also not competitive enough." Coulthard hit trouble during his second stop and tried to do what Massa had done and took off with the refuelling hose still attached. It cost him a little time but it was not quite the disaster that befell the Ferrari. Force India managed to get Giancarlo Fisichella home in 14th place, but Adrian Sutil crashed his Force India while avoiding Felipe Massa, who had spun in front of him. "I avoided a crash with him only to go into the barriers myself," he said. And so it was all over. The crowd went home happy. The TV viewers across Europe no doubt enjoyed their afternoon on their couches. Singapore had done a great job and one got the feeling that in the years ahead this will become a classic event.